The history of French bread is long and varied, leading to the popular, crusty loaf consumed by millions every day. Understanding this history can give you insights into the shape, texture and taste of the bread. The French have a long history of influencing culinary technique, from the terms used to describe cooking techniques, to the bread eaten daily by many people around the world. French bread is a characteristic loaf with tightly controlled ingredients. In fact, French law dictates that the loaves contain only flour, water, yeast and salt in varying quantities. A true French bread or baguette is long and slender with a thick, golden crust that should crackle when squeezed. The interior of the bread is springy and off-white in color with varying sized cavities distributed throughout the interior. 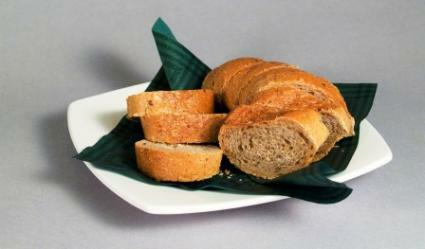 Despite its simple ingredients, the bread should taste slightly sweet and nutty with a buttery aroma. The beginnings of French bread can be found in Vienna in the middle of the 19th century. Prior to this period, bread was baked in a dry oven, producing a loaf that was less consistent in texture. The invention and use of the steam oven allowed for the control of temperature and baking time that produced a loaf of bread with a soft, creamy interior and thick, brown crust. In the 1920s, a law was passed to prohibit bakers from working before four in the morning. Since most bakers got up well before this to start their loaves, a change was made. Instead of forming the bread into the wide, flat loaves that had been previously been popular, bakers began to form their dough into long, thin loaves no more than 2-1/2 inches in diameter. This new shape allowed the bread to cook more quickly; bakers could now serve the breakfast crowd while obeying the labor law. The result of the new shape was a very thick, even crust that protected the inside of the bread from overcooking. The new shape of the bread was perfect for slicing into individual portions for sandwiches and quickly gained in popularity. While today's French bread has strict guidelines for selecting ingredients, this was not always the case. When the loaves were first being produced in Vienna, soft flours such as bean were used to help give the bread its characteristic flavors. During the second World War, food and ingredient shortages led to the bread being produced with inferior ingredients; fillers such as soy flour were used to continue to produce the loaves. At the time when ingredients were beginning to be found in adequate amounts again, mass production of the loaves began. This mass production led to further use of inexpensive ingredients and fillers to produce the bread cheaply. While many artisan bakers still used quality ingredients, the mass production of bread meant that most grocers and restaurants sold bread that was not up to the high standards first set by the bakers in Vienna. As the characteristic shape of the bread was beginning to be associated with the country of France, and the bread was eaten daily by many Frenchmen, questions were raised about the quality of the ingredients and the standards that were used to produce them. To solve the problem of the inadequate ingredients, a law was passed which would ensure that loaves of bread produced in mass quantities would contain a minimum of quality ingredients. The history of French bread gives lovers of this classic bread a peek into how it gained its characteristic crust, taste and texture. Consider this the next time you enjoy a fresh baguette.